For over forty years, Itinerario has provided a platform for scholars researching the history of imperial and global interactions. 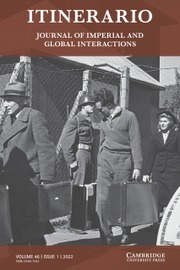 Published for the Leiden University Institute for History and mindful of the University’s entangled history with empire and colonialism, we encourage authors to take a global perspective. We aim to publish contributions which critically evaluate histories of empires, institutions, ideas, and networks across the globe, and the ways in which their legacies continue to shape the contemporary world. Itinerario is committed to sharing the results of academic research through a liberal green open access policy.